Pesarattu Dosa is a popular recipe from the Andhra cuisine. It is generally served alike plain dosa with added onion, green chillies and coriander leaves on top or with upma filling called as 'Upma Pesarattu' or 'MLA pesarattu'. In Telugu 'Pesalu' means whole green gram and 'Attu' means Dosa. This dosa made with greem gram is called pesarattu. It is a healthy dosa which has lots of protein in it. It is an easy to make dosa with lots of nutrients and the dosa is flavourful. After grinding no fermentation is involved in this dosa, and so it saves time too. 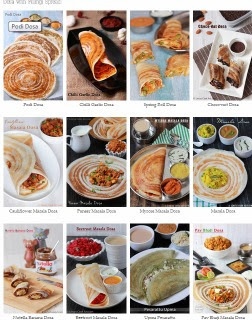 It makes crispy dosas if it is prepared as thin dosas. 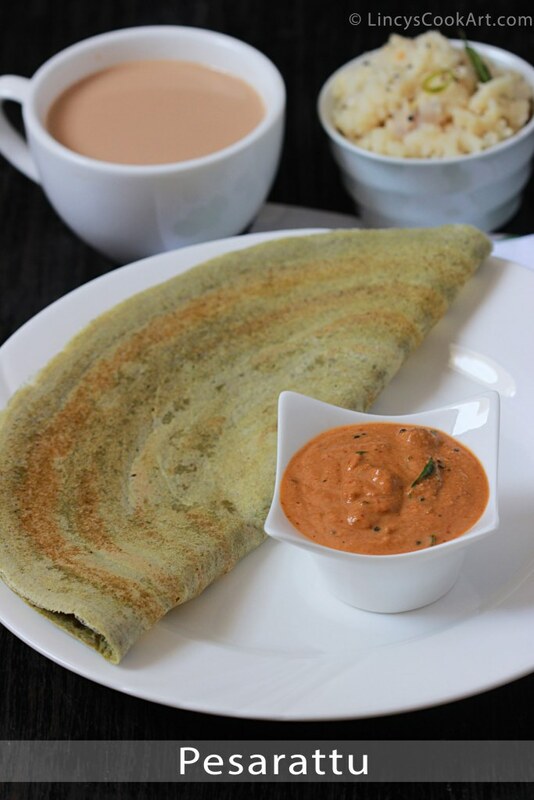 You could prepare this dosa thick like an adai dosa too. I have prepared it thin as it requires less oil to cook. Adding upma in this dosa is optional. Rava Upma: Click here for the recipe. Wash and soak green gram and rice together for 6-7 hours or overnight. Drain the water and add inside the blender jar. Roughly chop green chillies, ginger and coriander leaves and add with some cumin seeds. Add this in a deep bowl and add some salt and add a dash of water if you feel the batter is too thick. The consistency of the batter should be like idli batter. As it has froth in it it will be the right consistency to make dosas. No need for fermentation and you could make dosas right after grinding. Heat the dosa pan and grease the pan with oil take a ladle full of batter and spread to make concentric circles with the backside of the ladle. Drizzle half a teaspoon of oil on top of dosa and cook till crisp if you are making plain dosa. After spreading the batter sprinkle chopped onion and green chillies on top. Then drizzle with oil and keep the upma on top; once the dosa becomes crisp. Fold it and serve with Allam pachadi/ Ginger Chutney. Note: You could ferment the batter like normal idli dosa batter and use it. Refrigerate the leftover batter and use it. My favourite.. it's been ages since I made it.